See also Architecture, Follies and Places Journal. From 2002-2006 I lived in this old and wonderful little cottage in the tranquil and picturesque village of Great Offley, between Luton and Hitchin (directions are available for the lost). The house in the woods where I used to live, Michael's Folly is a charming Edwardian cottage near Hertford. 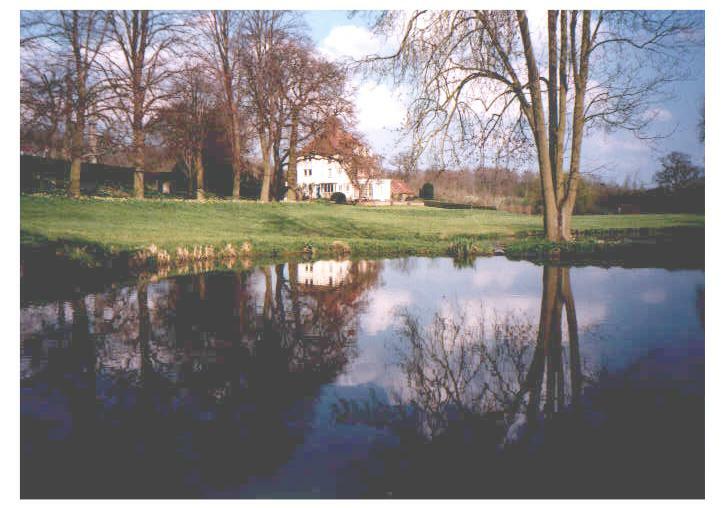 The house of David and Mary Parsons reflected in the lake. Dartington Hall near Totnes in Devon hosts the Dartington International Summer School. 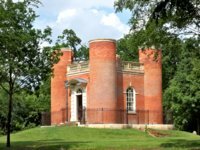 Queen Anne's Summerhouse is a delightful folly in Bedfordshire. 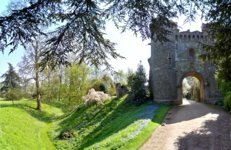 Benington Lordship is a large manor house with splendid gardens and castle gatehouse folly built onto the side of the house. 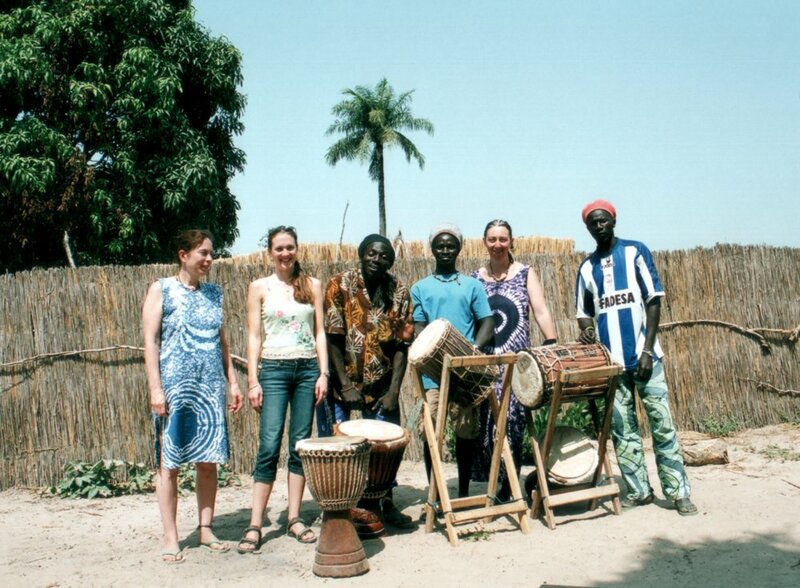 When visiting Senegal on a drumming holiday, I stayed at Cassiopeia in Abene. Warden Abbey, near the picturesque village of Old Warden in Bedfordshire. Boston Stump, a marvellous landmark towering over The Fens, and its namesake in Oxfordshire: another church of St. Botolph. Two round churches: Temple Church (right) and another in Tufnell Park, North London. Rievaulx Abbey and Druids' Temple in Yorkshire. Ely Cathedral and Coventry Cathedral both have stunning stained glass windows. 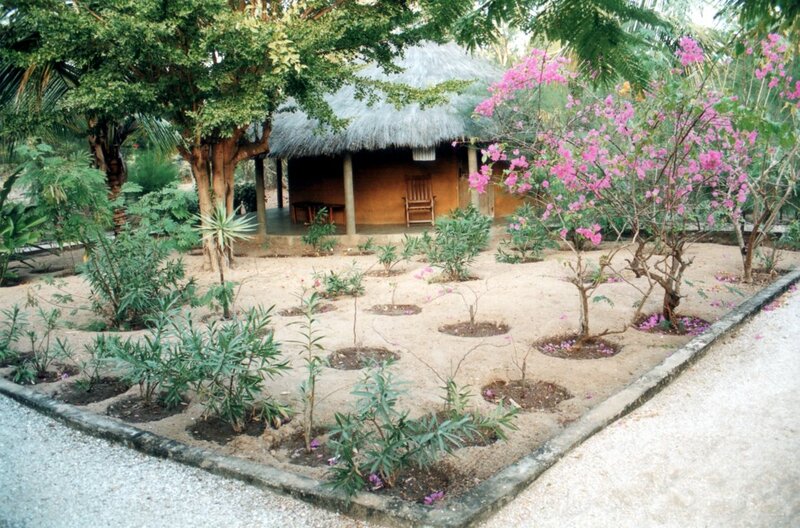 The creek and beautiful tropical gardens of Abene in Senegal. 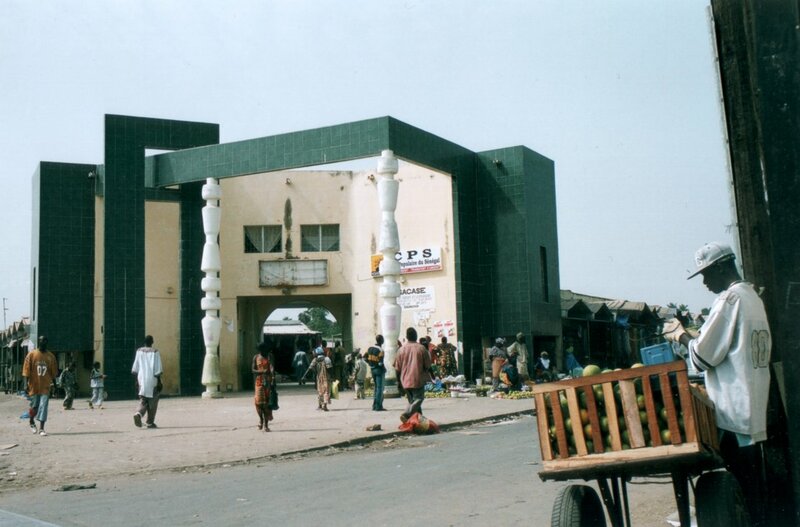 A colourful street and the market in Ziguinchor, Senegal. 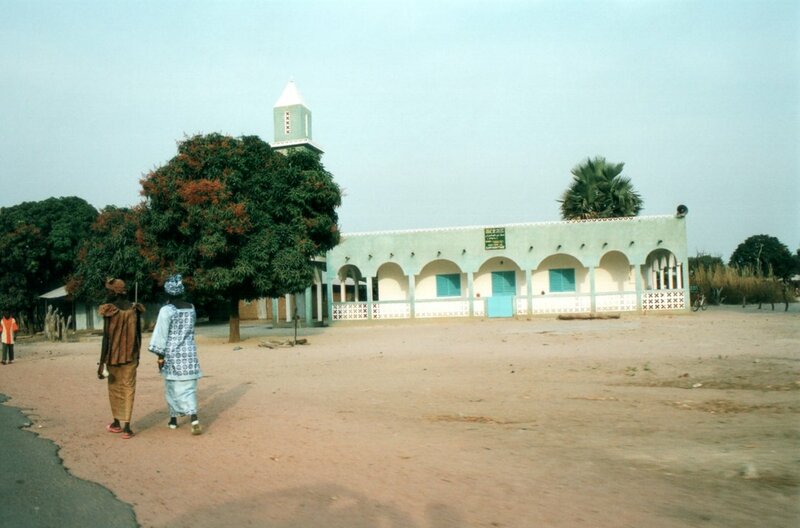 Internet cafe and church in Kafountine in Senegal. Travelling across the savannah in Senegal. Sundrenched cliff of Haytor Rocks on Dartmoor in October 1999. Malham, near Settle, in the Yorkshire Dales is my favourite place in the world. There are some stunning walks to be had around the village of Great Offley, seen here resplendent in rust red autumn 2003. The Tree Cathedral near Whipsnade Zoo on the Dunstable Downs is a small wood planted in the shape of a cathedral, with a central aisle and smaller 'chapels' off to the sides. 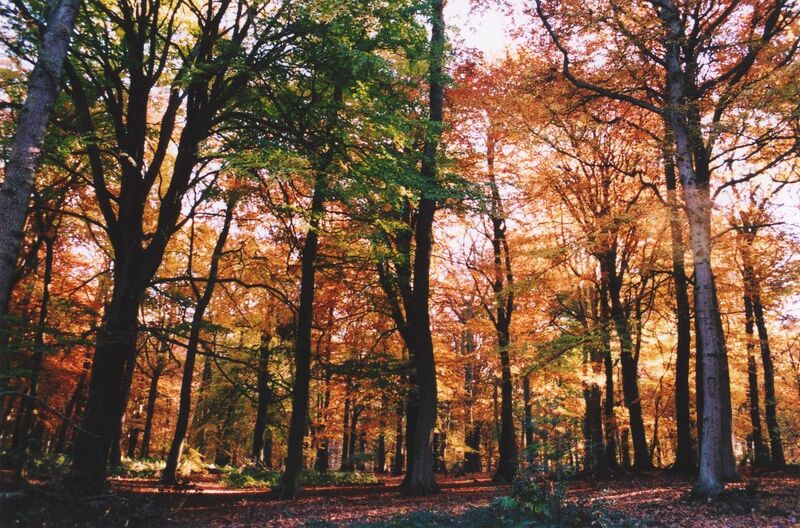 It's an inspirational place for a contemplative visit, seen here looking particularly colourful in autumn. 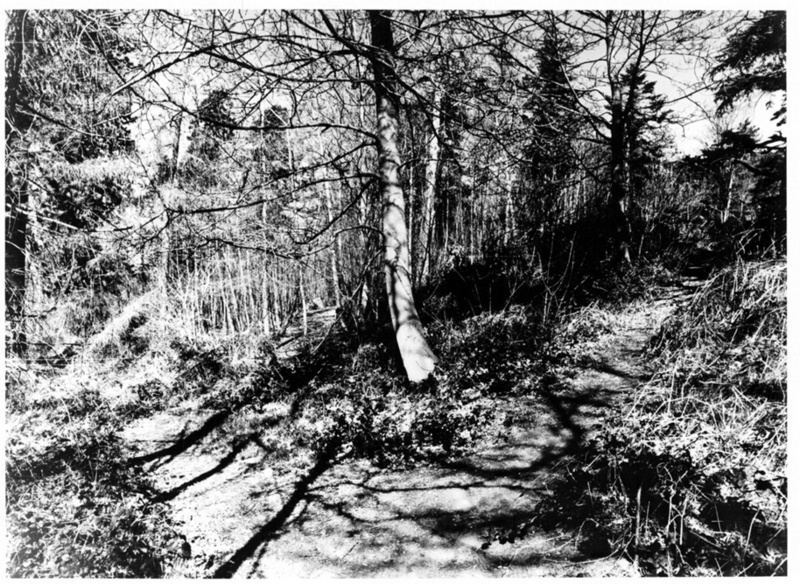 Left: The Land of Narnia, a magical valley I only discovered in winter 2001, in Ponsbourne Woods just ten minutes' walk from Michael's Folly. 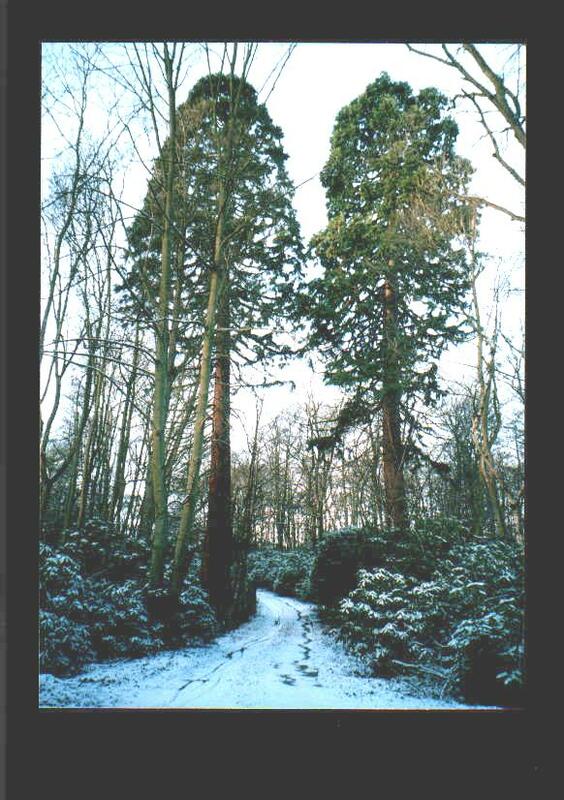 These two huge trees guard the entrance to this snowy kingdom of paradise. 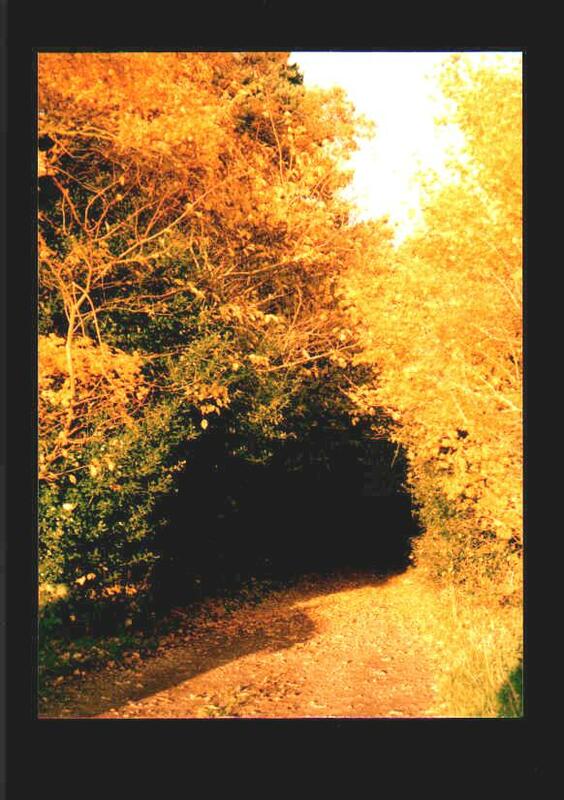 Right: Golden leaves down the lane near Michael's Folly lit by radiant sunshine in Autumn 2001. "The Tree Of Fate", photographed by Craig Morrison in the woods at Hooke's Grove, Bayfordbury near Hertford, a mystical place where we used to camp and play music; many surreal events occurred here... This image was recorded using a Canon EOS600 and processed in the darkroom using multiple multigrade filters to achieve extremely high contrast (no, it wasn't snowing then - this was taken in bright sunshine in summertime!). 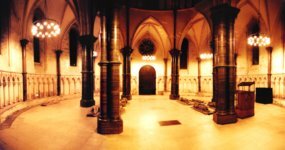 His picture was a deep inspiration on my (still unfinished) symphonic poem Judgement Day, and shows two paths, one leading to the light, the other to darkness. It is your choice. 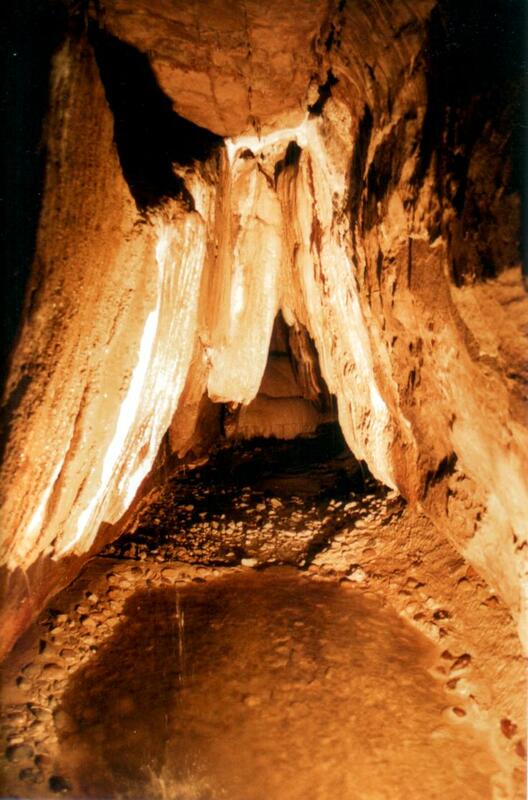 Peak Cavern in the village of Castleton in Derbyshire is the largest natural cave entrance in the British Isles, and leads to 17km of tunnels and chambers beyond (experts only). This rain-free chamber has been used for 400 years as a dry place in which to live and work, and hemp rope has been made here right to the present day. 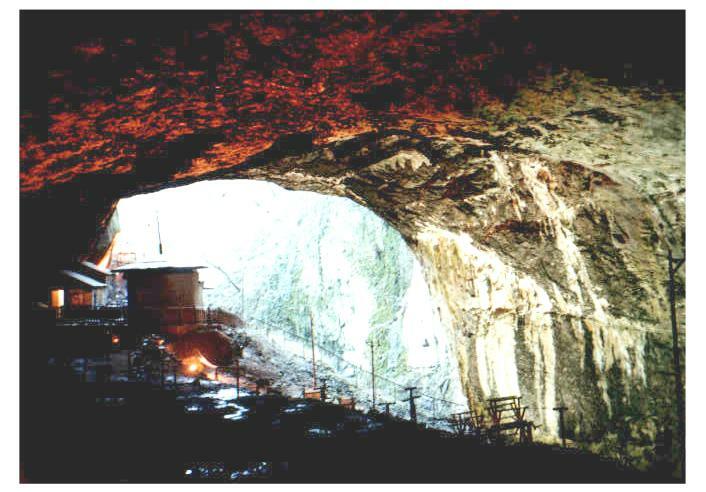 Other caves near the village are Speedwell Cavern, where one journeys into an old mine by boat, Treak Cliff Cavern, and Blue John Cavern, where the precious stones are mined. Also in the area are Peveril Castle, the very scary Winnats Pass, Mam Tor and Ladybower Reservoir. The Gothic Arch in Ingleborough Cave in Yorkshire.